Join us for a Fieldworks screening! 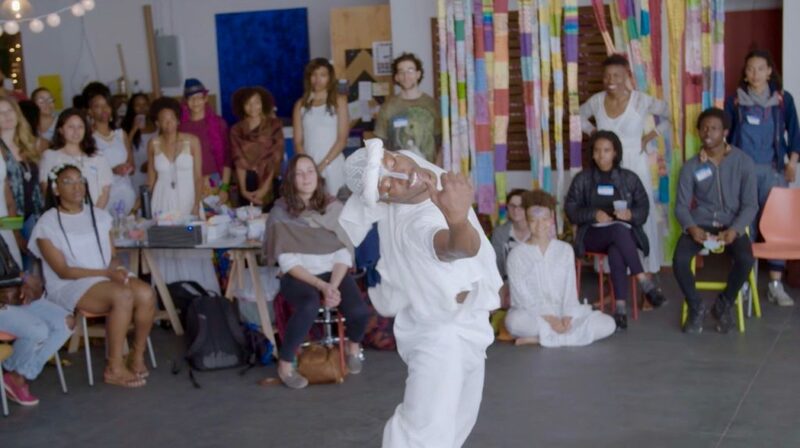 This screening will showcase projects by ABOG Fellows centered around the themes of healing and learning, featuring artists Brett Cook, Mel Chin, Joseph Cuillier, Pablo Helguera, The Plug-In Studio, SexEd, and Adaku Utah. A Q&A will follow with Deborah Fisher, Executive Director of A Blade of Grass. This screening is presented as part of Open House for Open Engagement 2018. Open Engagement (OE) is an annual artist-led conference dedicated to expanding the dialogue around and creating a site of care for the field of socially engaged art. This year’s theme is SUSTAINABILITY. FIELDWORKS is a short documentary film series produced by A Blade of Grass and RAVA Films that explores the beauty, rigor, and impact of socially engaged art. Guests should specify to the front desk staff that they’re there for the A Blade of Grass screening. Staff will then sign them into the building and direct them to the 7th floor. Sign-in includes having a photo taken.